Learning a new UI engine is always tricky. Thankfully, the Flutter team has highlighted the basic widgets. For this code tutorial, we will focus on Row and Column, which lay out a list of child widgets in the horizontal and vertical direction respectively. First off, my favourite thing about them is that, even though you may mistake them for Android SDK’s LinearLayout at first, they are actually far more flexible, yet easy to understand. To figure out how Row and Column work, we will start from 3 different mock-ups and lay them out using them. We will do this as part of an app with 3 screens (one screen per example). For each example, we will have a rough sketch of what we want, with notes to describe how each part of the layout behaves. Why rough hand drawn sketches and not fancy mock ups done in Photoshop? Because I want to show you a simple process that you can apply to your own mock ups. Oh, and also because pen and paper is a very useful tool (see Tip 3 of 4 tips to boost your software development career). The documentation is rich in explanations about how Flutter lays things out, but, when you’re starting out, this is a bit daunting. 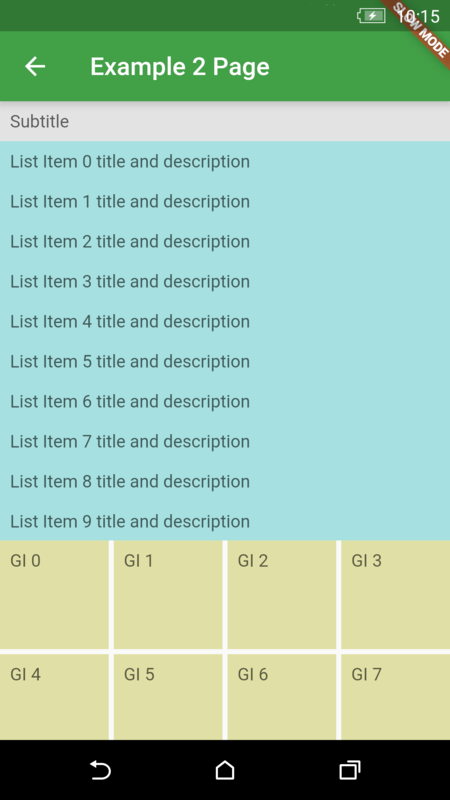 So, I’ve extracted a few basic Flutter UI rules that will allow you to build many layouts. elements have sensible names and the search feature on the website is pretty good, so use it! For example, if you search for text, you will see both the Text widget and a page listing the different types of available Text widgets. We will set up the app to have 3 screens, namely Example1Page, Example2Page, and Example3Page. So let’s amend main.dart to launch the app on the first example screen. Now, we create example1_page.dart, example2_page.dart and example3_page.dart, with a simple navigation from 1 to 2 and from 1 to 3 via buttons in the toolbar. // a full screen is likely to be a stateful widget. For this example, we will create a screen with a subtitle (below the toolbar) which is always shown, a call to action button at the bottom, which is also always shown, and some other content in between the two. 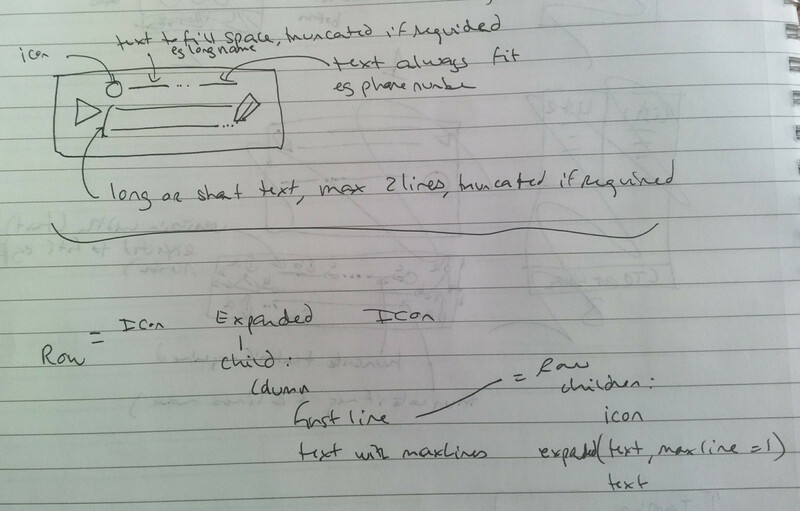 Let’s start with a sketch of the screen, annotated with descriptions in plain English. Then, we convert the descriptions into Flutter widgets. Now, we implement the design in example1_page.dart. For this example, we will create a screen with a subtitle (below the toolbar) which is always shown, a list which takes up 2 / 3 of the space below the subtitle, and a grid which takes up 1/ 3 of the space below the subtitle. Now, we implement the design in example2_page.dart. // Note: Placeholder method to generate list data. For this example, we will create a widget that would most likely be used in a list. 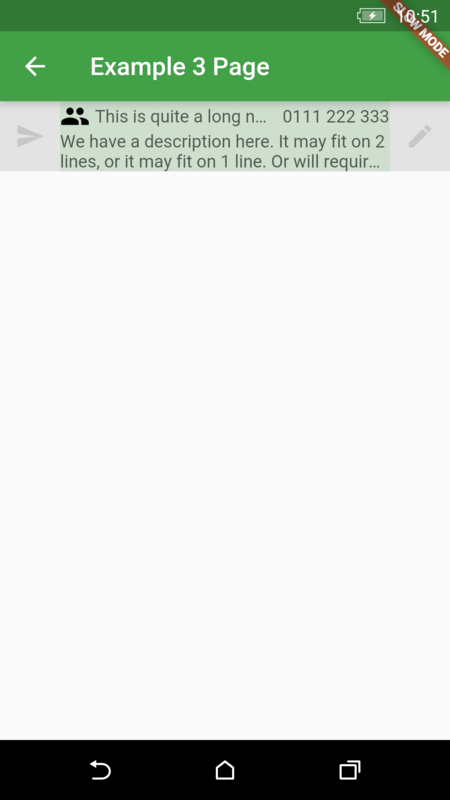 It has an icon on the left and one on the right, a title which itself is made up of an image, and 2 separate pieces of text (one of those to be truncated as required), and a description to be restricted to 2 lines. Now, we implement the design in example3_page.dart. From one of your favourite apps, or an app you are working on now, choose a screen, and work out how you would lay it out in Flutter. Great post. There is not much documentation on how to use the layout widgets together so this is very helpful. One anomaly in your first design. If there is an entry form in the middle, the bottom footer slides up with the keyboard. Do you know a way to get the keyboard to cover the bottom footer instead? It seems to address the keyboard pushing content up issue. 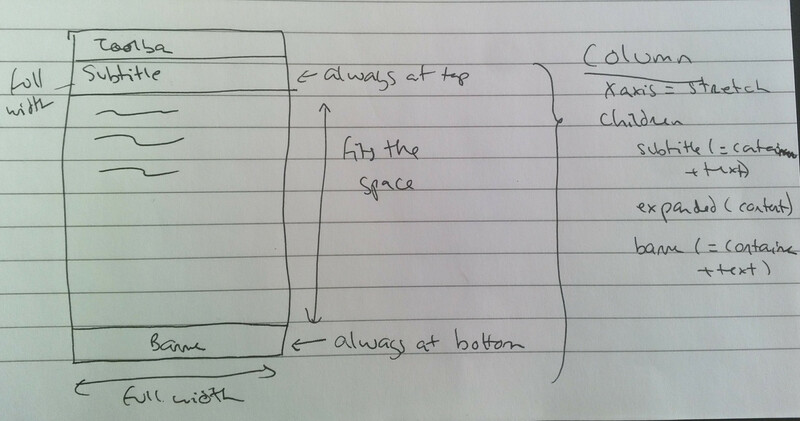 Excellent post, layout was tricky for me since I’m not a native dev — this helped a bunch. Remember me? We worked together in ubicabs. I was working remotely as android dev then. 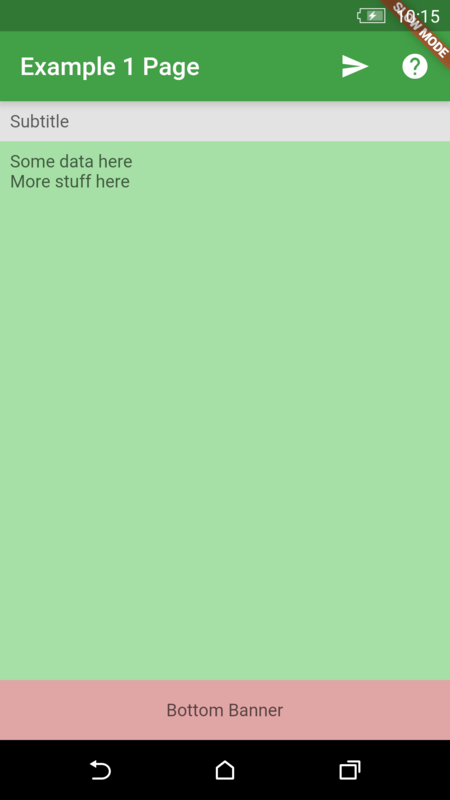 Previous Previous post: How to startActivityForResult in Flutter?